Plantar warts are not caused by frogs, toads, or any other amphibian. Hot showers will actually dry out your skin, even though its water. A misconception you can add to that list is “arthritis is only one condition.” Why is this wrong? Because there are actually over 100 different kinds of arthritic conditions! The reason people think it’s a single condition likely comes from the fact one of these conditions is more prevalent than the rest. (We’ll discuss this momentarily.) In reality, the word arthritis literally means “joint inflammation”—the root “arthron” means joint and the suffix “itis” always refers to inflammation—and there are several medical issues that can cause a joint to swell. This is very relevant to foot health because each of your feet and ankles have 33 total joints that could potentially become pained and swollen. Osteoarthritis (OA). When we noted earlier how people usually think arthritis is only a single condition, this is the one they are thinking about. In all fairness, osteoarthritis is the most common. Further, it affects the senior population at much greater rate (to the point some think it only happens as we reach advanced years). For all intents and purposes, you can consider OA to be the “wear and tear” version of arthritis that begins to emerge as protective joint lining is broken down over time. Rheumatoid arthritis (RA). This particular form of arthritis—although, there are groups out there who believe RA should not be considered arthritic—is caused by a chronic inflammatory disease. Because of the disease, your body’s own immune system begins attacking regular body tissues, including joint lining. The exact cause of this condition is unknown, but researchers believe it to be genetic in nature. Typically, an infection or environmental factor triggers the issue. At present, the condition itself cannot be cured. So instead, treatment is centered on relieving symptoms. Gout. Typically affecting the joint located at the base of the big toe, gout is a form of arthritis that develops on account of excessive uric acid buildup and crystallization. Uric acid is a normal byproduct of digestion, and it typically filtered out through the kidneys and expelled during urination. With gout, the uric acid is either produced in an excessive quantity or not disposed. When excess gout settles into joints, it forms crystals. Urate crystals have sharp edges, which can press into soft tissues and cause the severe pain associated with gout. Post-traumatic arthritis. Sometimes, the explanation for painful, inflamed joints is an injury that happened years ago. In this case, we consider the condition to be post-traumatic arthritis – and the root cause is typically a bone that was broken at some point in life. The timing of emergence for this kind of arthritic condition can vary wildly. For some people, it is years before the problems develops. Others start to experience it months after the initial injury. Regular exercise. We know it might seem counterintuitive to move more often when stiff, inflamed joints make it painful to move, but exercise is one of the best ways to combat the effects of arthritis. Proper medication. Our office will either prescribe or recommend certain medications that can relieve pain and reduce inflammation in affected joints. Plenty of vitamin C. Studies show that vitamin C plays a role in managing inflammation in the body, including in arthritic joints. Managing your weight. The amount of force on feet when walking or running is multiple times the weight of your body. The less your body weighs, the less force placed on arthritic foot and ankle joints. Adhering to a gout-safe diet. Gout is an arthritic caused by a product from breakdown of certain foods. You can manage, and even prevent, the condition by eating a diet centered on fresh fruits and veggies, an increase in water intake, and limited quantities of fatty meats. Our hope is to resolve your pain and difficulty with nonsurgical means, but there are definitely cases—particularly ones that are rather severe—wherein surgical intervention constitutes the best opportunity to resolve the problem. Arthrodesis (fusion).Arthrodesis is a procedure wherein we fuse the bones of the joint completely together, thereby making one continuous bone out of two or more bones. The goal of this particular procedure is to reduce pain by eliminating any possible motion in the arthritic joint. Arthroscopic debridement.This surgery is often helpful in early stages of arthritis. Debridement (cleansing) is a procedure we use to remove loose cartilage, inflamed synovial tissue, and bone spurs from around the arthritic joint. Total ankle replacement (arthroplasty).In a total ankle replacement, we remove the damaged bone and cartilage, and then position new plastic or metal joint surfaces to restore the function of the affected joint. There are pros and cons of each respective type of surgical procedure we use to treat arthritis, and we will carefully review these with you beforehand. It’s important to us that you are educated on surgery and able to make an informed decision. If you ever have any questions regarding your planned procedure, simply let us know and we will be glad to answer them for you. If you have any questions about arthritis and how it can affect the lower limbs, or if you need to schedule an appointment for diagnosis and treatment, contact our Bloomington office and we will be glad to help. No matter if nonsurgical or surgical arthritis treatment is right for your case, you can trust our team to work hard to provide the care you need. 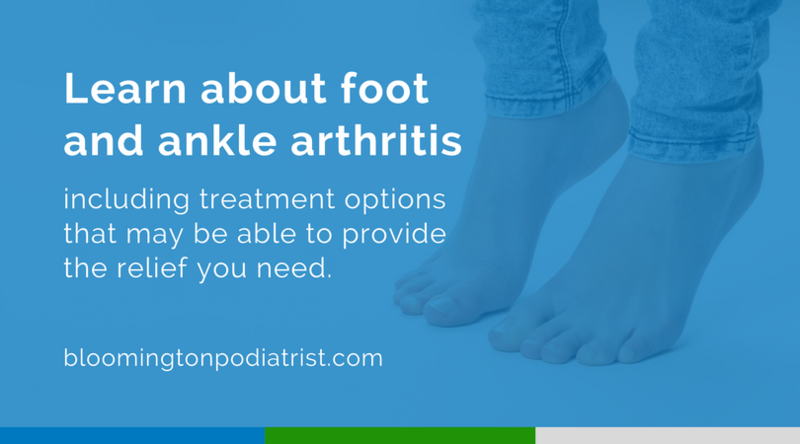 For more information on arthritis in a foot or ankle—or to request your appointment—call (812) 333-4422 today!